We are pleased to welcome several new tenants to Downtown San Diego living! Congrats and welcome home to the new tenants at Union Square 1304, Horizons 1802, CityFront Terrace 1009, and Electra 401!!! Please do not hesitate to call us at 619.238.6886 if you need anything. For everyone else . 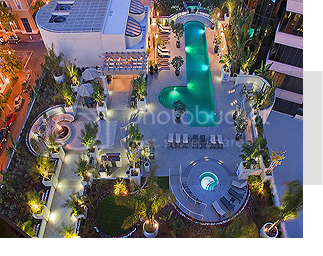 . . we just wanted to let you know that we still have some great Downtown San Diego condominiums available for lease! Click HERE to see what is currently available. Interested in luxury Downtown San Diego living without having to buy? Lease one of our available Downtown San Diego properties and live the luxe life without breaking the bank. Harbor Club Residence 401 is now offered at just $2,900/month. Click HERE for details on this 2 Bedroom/2 Bath high rise condominium residence located in one of Downtown San Diego's most sought after addresses. For your own private showing or for more information, please call 619.238.6886. Luxury Real Estate member and the Centre City Properties Broker, Patricia Leone, has a new profile live on LuxuryRealEstate.com! Click HERE to visit Patricia Leone's NEW Profile on the Luxury Real Estate website. Her new profile can link you directly to our office, to her Featured Luxury Real Estate listings, to past and present listings, and to her most recent LuxuryLounge activity. The LuxuryLounge is a place where Clients, prospective Buyers, and the social network can easily and quickly communicate directly with our office. Please feel free to peruse Ms. Leone's NEW Profile on LuxuryRealEstate.com today. CityFront Terrace Residence 128 is not the only offering at CityFront Terrace. Click here to find more available properties at this popular Marina District community. 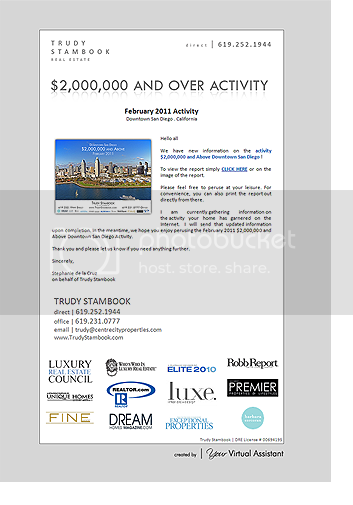 The February 2011 $2,000,000 and Above Activity Downtown San Diego reports are in! Email "STAMBOOK REPORTS" to stephanie@centrecityproperties.com to get your copy today. You can also click here to find out more. 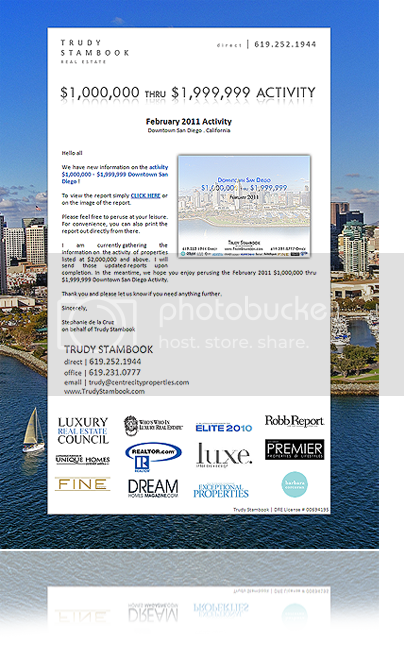 The February 2011 $1,000,000 - $1,999,999 Activity Downtown San Diego reports are in! CityFront Terrace Residence 128 is now offered at $639,000! Click here for more details on this opportunity. You can also call agent Michael Lange at 619.807.2066 to view this CityFront Terrrace residence. We are also pleased to report that San Diego PREMIER magazine features Centre City Properties in their current issue. To get your copy of the February 2011 issue of PREMIER magazine, please visit our office at 220 West G Street, Suite A, San Diego, California 92101 or CLICK HERE to see Centre City Properties. Your can call us at 619.238.6886 for more details on our available downtown properties.